The HD DVD spin doctors are at it again. This morning comes the news that overall HD DVD hardware sales in the US went up by 37 percent in the first three months of the year. At the same time, HD DVD movie sales experienced a "20 percent increase in growth". During the same time-frame, overall Blu-ray hardware sales saw a 27 percent decline in the same time period, with Blu-ray software sales down 5 percent, the North American HD DVD Promotional Group claims. It's important to point out that a "20 per cent increase in growth" of movie sales is not the same thing as sales being up by 20 per cent. So they're not seling as many HD DVD movies as perhaps they'd like us to believe. It's also worth mentioning that in a market where standalone player sales are still well below 200,000 in a population of 300 million, a sales bump of 37 per cent is as close to meaningless as makes no odds. Predictably, the HD DVD camp has wheeled in one of its third-party supporters to back it up with a few one-sided quotes. Ken Graffeo, CEO of HD strategic marketing at the HD DVD-supporting Universal Studios , said "The numbers are clear," he says. " HD DVD is steadily gaining momentum and market share. 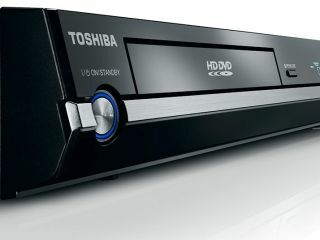 With HD DVD players now at MSRP prices starting at $299 (£150) and with strong marketing campaigns around new HD DVD titles with web-enabled interactive features, we're continuing to raise the bar for the consumer experience." In terms of standalone player sales, HD DVD is in the lead over Blu-ray in the US and also in Europe. The Blu-ray camp does, however, like to include PS3 sales in its own sales figures, putting it well in the lead over HD DVD. Perhaps the only way to judge which side is winning would be in movie sales? Blu-ray is well ahead on that score. But really, this still isn't a war. It's still handbags at the OK Corral , and no one else seems to give two hoots about it.